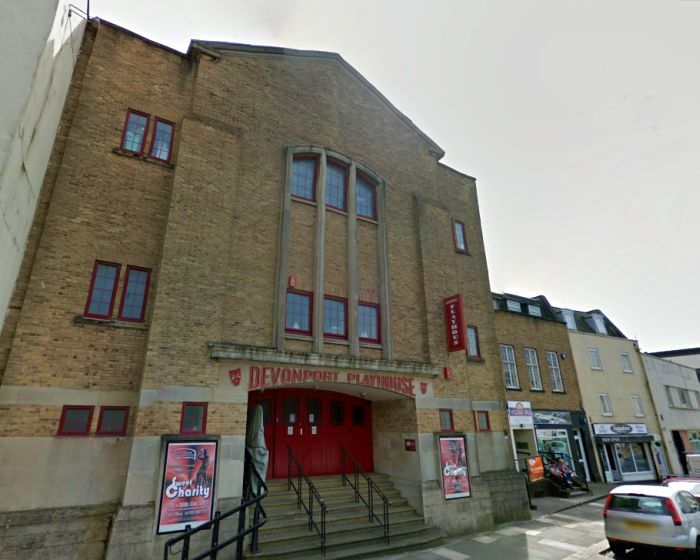 The Playhouse is situated on Fore Street, Devonport and stands on the site of the former Wesleyan Methodist Central Hall which was destroyed by bombs in WW2. The building was subsequently rebuilt by the Methodists in the 1950s and has since been split into two, one half of which forms the Playhouse of today. The Playhouse was started when the empty half of the building was bought by the Plymouth Amateur Operatic Company in 1988. The Company had been operating since 1899 but this was to be there first true home and they set about converting the space into a proper Theatre with stage, orchestra pit, dressing rooms, wardrobe facilities, a Green Room, and a 350 seat auditorium. Now known as the Plymouth Theatre Company, you may like to visit their own website here. Above - An early photograph of the Devonport Hippodrome - From a 1912 variety programme. The Devonport Hippodrome opened on the 14th of September 1908 with a twice nightly variety show with the Albert and Edmunds Comedy Troupe in their sketch called 'Neighbours', and other acts by Jack Lorimer, Stella Stahl, Russell Brandow, Conn and Conrad, Lily Flexmore, and Gorrnan's Juveniles. The show concluded with Vernon's Imperial Bioscope. The Theatre was designed by the well known Theatre Architect, Bertie Crewe, and was constructed by J. Parkinson and Sons, of Blackpool, for Alfred Moul, the director of United County Theatres LTD at the time. Right - A Variety programme for the Devonport Hippodrome for the week of June the 24th, 1912. 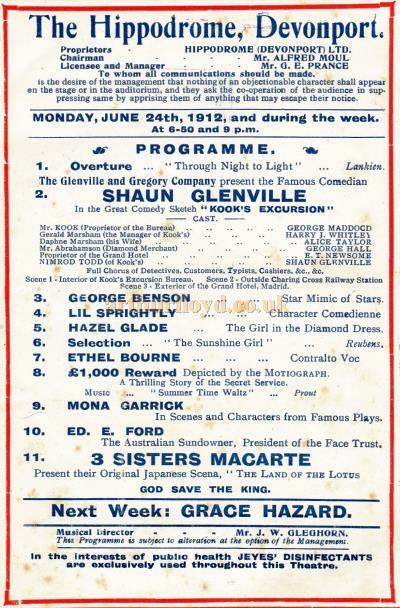 On the Bill were the Glenville and Gregory Company with 'Kook's Excursion', George Benson, Lil Sprightly, Hazel Glade, Ethel Bourne, Mona Garrick, Ed. E. Ford, and the Three Sisters Marcarte - See the programme listing below. 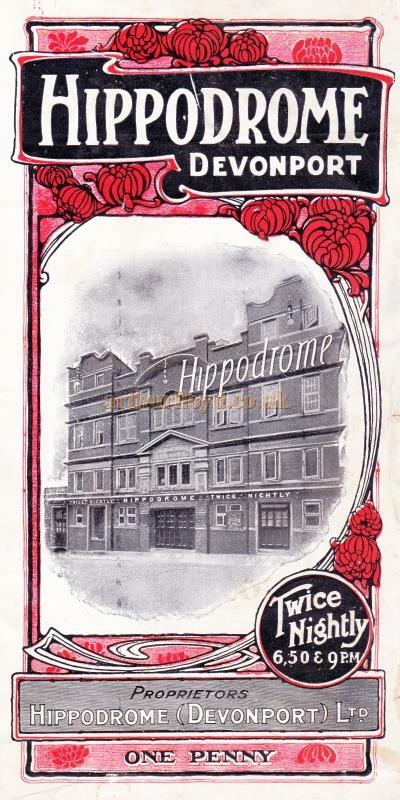 The Stage Newspaper carried a report on the Licence application for the Hippodrome in their August the 6th 1908 edition saying:- 'Last Thursday Mr. Jack Field, manager of the New Palace, Plymouth, applied to the Devonport Watch Committee for a stage play license in respect of the Hippodrome. Princes Street. Mr. T. H. Gill said the application was in respect of a building erected at an expenditure of upwards of £20,000, and one that they hoped would conduce to the prosperity and advantage of Devonport and the neighbourhood generally. The application had the support of a company known as the Hippodrome (Devonport), Limited, which was controlled by Mr. Alfred Moul, managing director of the Alhambra. It was desired that the committee should grant a full dramatic License, with a full Excise license, and it was proposed to have four bars in the building. The music hall, or theatre, would be opened on or about the 21st. Replying to questions. Mr. Jack Field said it was proposed to carry on the Hippodrome as a music hall. He wanted licenses covering music, dancing, smoking, drinking, and sketches. A License that did not admit of smoking in the auditorium would not suit a music hall. Mr. Alfred Moul said that he was chairman of the board who were erecting the building. The Hippodrome was built for a music hall. He did not wish to run the Hippodrome as a theatre, and only wanted a stage-play licence to cover such things as sketches. They proposed to carry on the Hippodrome precisely as the Palace. The above text in quotes was first published in the Stage Newspaper, August the 6th 1908. The Devonport Hippodrome did obtain its Licence and duly opened on the 14th of September 1908 with a twice nightly variety show. The Stage Newspaper carried a report on the newly built Theatre and its opening a few days later in their 17th of September 1908 edition saying:- 'On Saturday the Mayor of Devonport, Mr. Richard Smerdon, laid the commemoration stone of the Hippodrome, which has been built by the Hippodrome, Davenport, Limited, and adjunct of the United County Theatres, Limited. The building is situated in Princes Street, in the centre of the business portion of the borough, and fulfills every requirement of the up-to-date theatre of varieties. Left - Cast details from a Variety programme for the Devonport Hippodrome for the week of June the 24th, 1912. The front is of terra-cotta brick, with Portland stone facings. From the top hang three powerful arc lights and an illuminated sign (Hippodrome) covers the best part of the front. The interior is beautifully decorated. The ground floor is laid with heavy carpeting, and the seats are of the latest tip-up kind, and all cushioned. The circle is on a similar scale of decoration and upholstery, the latter being of red plush. In all parts of the house electric fans are furnished. Refreshment bars are attached to the stalls, pit, circle, and gallery. The wall decorations are red with a white dado, and the balconies and proscenium front are carved and gilded. There are two spacious boxes. The ceiling design consists of a large painting representing The Seasons. The hall is heated by gas radiators. The stage, which is 58 ft. by 32 ft., with a 28 ft. proscenium, is furnished with a fire-screen and a sprinkling apparatus as protection from fire. The doors connecting the stage with the house are all fireproof and self-closing. The dressing- rooms are numerous, occupying the whole height of one-side of the building. There are waiting-rooms and cloak-rooms in different parts of the house. Altogether the building can accommodate from 1,500 to 1,600 persons. 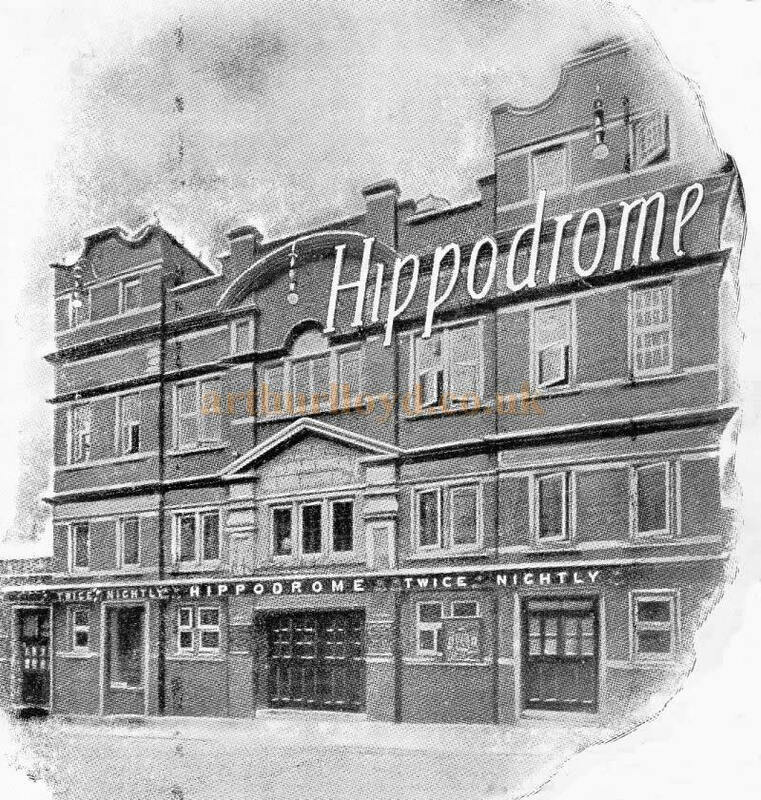 The Hippodrome has been constructed by Messrs, J. Parkinson and Sons, of Blackpool. Mr. Bettie Crew, of London, is the architect. Mr. Roy 'Young was clerk of works, and Mr. H. Leigh manager for the builders. Mr. John Field, of the Palace, Plymouth, who is also local manager and licensee of the new house, has supervised the arrangements. The acting-manager, Herbert Taylor, who is well known here, was at one time acting-manager of the Royal, Plymouth. Mr. Harry Pedgeon is the stage manager. A large and efficient orchestra is under the baton of Mr. J. W. Gleghorn. On Monday evening the opening performances (twice nightly) were very successful. In the interval Mr. Alfred Moul, chairman of directors, appeared on the stage, and on behalf of the directors of the Hippodrome, Devonport, Limited, thanked all who, by their presence, had assisted at the first performance. He said that everything would be done to supply a clean and healthy programme. The above text in quotes was first published in the Stage Newspaper, 17th of September 1908. Although the Devonport Hippodrome opened as a variety Theatre this incarnation was not to last long. The Theatre was already showing early Bioscope Pictures even on its opening night and on the 1st of June 1929 the Theatre closed as a live theatre and was then enlarged and altered for conversion into a 2,000 seat Cinema by the architects Marshall & Tweedy. The Cinema reopened on Monday the 23rd of December 1929 with a showing of the film 'Broadway Melody'. However the stage was retained and the opening of the Cinema did also include Ted Coleman's Waldorf Band playing live on stage. The Theatre was taken over by County Cinemas in September 1939, who ran it until disaster struck on the 23rd of April 1941 when it was hit by German bombs and gutted by the ensuing fire. The Theatre never reopened but the ruined building remained until in was finally bought by Plymouth Council for £4,000 and demolished in March 1958. 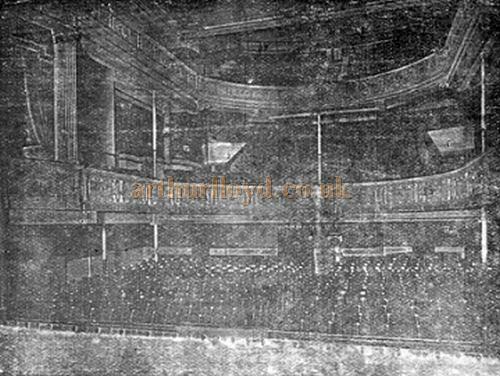 The Alhambra Theatre opened on Easter Saturday, April 19th 1924 and was built on the site of several former Theatres. There is more on the Alhambra below but there now follows a history of the site in chronological order. The first Theatre to open on this site was the Empire Theatre which was constructed in 1893 and opened on Monday the 26th of March 1894. The Theatre was built for, and by, the local builder Samuel Roberts, and designed by his son. Roberts had also built the Grand Theatre in Stonehouse. The Empire Theatre seated around 1,000 people and its entrance was reached through an arcade of shops. It's manager was John Ryland. In 1896 the Theatre was renamed the Metropole Theatre and was reopened by Roscoe Carlton and Edward Leeds on Monday the 24th of August. The opening week's productions were all Shakespeare plays, beginning with 'The Taming of the Shrew" on the Monday, and then on succeeding days 'The Merchant of Venice', 'Hamlet', 'Twelfth Night, 'She Stoops to Conquer, and 'Richard III', all performed by F. R. Benson's Shakespearean and Old English Comedy Company. Arthur Carlton eventually became the sole lessee of the Metropole and in January 1899 he bought the Theatre and its adjacent shops. Electricity was installed in 1903, and in 1912 a Cinema Licence was obtained and the Theatre reopened as the Palladium Theatre on the 5th of August the same year. This should not be confused with the Palladium Cinema in Ford. In January the name was changed yet again, this time to the Picturedrome, and in February 1914 it became the Metropole (Picturdrome). In September 1923 the Theatre was put up for auction but there were no bidders, however John Tellham then bought it and set about a major rebuild, reopening the Theatre as the Alhambra Theatre on Saturday the 19th of April 1924. Right - The auditorium of the Alhambra Theatre, Devonport from a 1929 programme cover. The Stage Newspaper reported on the Theatre's opening in their 24th of April 1924 edition saying:- 'The New Alhambra, Tavistock Street, Devenport, had a splendid send-off when it opened its doors for the first time during the Easter holidays. On the Saturday the stage was occupied by a revue given by local amateurs in aid of charity, and among those who were in the crowded house was the Mayor of Plymouth, Mr. Solomon S. Stephens, who paid a warm tribute to the enterprise of the proprietor, Mr. J. Tellam, under whose leadership and supervision the theatre had been remodelled and renovated, and to the efficiency and popularity of the Manager, Mr. G. E. Prance. The Mayor, who, with Mrs. Stephens, occupied one of the admirably constructed boxes, said he was convinced that there was really room for a theatre of this kind at the western end of the borough, and he appealed to the people of Devonport to give the management the reward that enterprise always deserved. The opening proper was on Easter Monday, when Cyril Boganny presented the revue in which the chief parts were sustained by Joe Bogenny, Little Monty, and the London Follies Girls. The opening ceremony was performed by Sir Gerald Fowler Burton, who made an interesting speech. He recalled that the first theatre in Devenport (then called Dock) was established in 1762, and during the height of the Napoleonic War, when the dockyard was in full activity and the town was filled with officers and seamen with their pockets well lined with pay and prize-money, this theatre, called the Royal Dock Theatre was liberally patronised. On the stage of that shabby little building in Cumberland Street many great theatrical celebrities, among them Mrs. Siddons, appeared. Sir Gerald said that when child, he attended the opening performance of the next theatre to be built in Devonport which was situated at the top of Fore Street. On the site of the New Alhambra was the Metropole, owned by Mr. (now Sir) Arthur Carlton, where all melodramas were staged, and where Sir Henry Irving and Sir Frank Benson, as well as the Carla Rosa Opera Company, had appeared. For a long time this theatre was very popular with naval men. Now they had the New Alhambra, the beautiful theatre for which they were indebted to Mr. Tellam, and with a man of the ability and the experience of Mr. Prance as manager they were assured of an excellent entertainment, and he trusted they would all support their efforts heartily. In the course of a few remarks Mr. Prance stated that it was the intention of the management to keep the prices of admission to the theatre at the lowest possible level. The best companies were being booked, and for a short time all classes of attractions would be staged, with a view to discovering which kind the audience most favoured. Owing to the lowness of the prices, the fact that every seat in the building, from the sixpenny balcony down, could be booked without fee, and that no entertainment tax wax being charged, it was necessary that the theatre should be well filled at every performance. For a few weeks revues would hold the boards, but shortly Charlie Chaplin's latest film, A Woman of Paris, would be given its first run in Plymouth. He mentioned that the management was very proud of their kinematograph machines, which arrived only the previous Saturday. These were of the very latest pattern and identical with those in use at the Capitol Theatre, New York, the largest picture theatre in the world, which seated 5,000. If any of the audience ever was interested in them, the management would be very pleased to exhibit them and the splendidly equipped operating-box at any convenient time. Except for the front wall of the old Metropole, which has been retained intact, the New Alhambra is an entirely new building, the interior having been wholly reconstructed with three floors, affording accommodation for fauteuils stalls, grand and upper circles, balcony, and two boxes unusually well placed for viewing the stage. A perfect view is given to every part of the house, the original difficulty in this respect having been eliminated by the lowering of the stage and the cutting away of part of the balcony decoration. The interior is extremely attractive, the walls being decorated in contrasting shades of buff and brown, with handsomely papered panels, the luxurious seating being of Royal Blue upholstery with gilt fittings. The three colour lighting scheme enhances the delicate colourings of the walls and seats, and forms an harmonic whole with the Rose du Barry carpets and lamp shades. The staircase is of mosaic stonework and is covered with moquette carpet. Not only are the electrical appliances of the latest pattern, but the heating arrangements are most ample, radiators fed by a central heating system being scattered liberally throughout the building. The full-sized stage is equipped with a complete set of new scenery, together with the usual fireproof curtain and other forms of protection against fire. The artiste's accommodation is quite up-to-date for each dressing-room is provided with washing basins, with hot and cold water, and there is a special rest room for the comfort of the players. The theatre has a full license, and the bar is well fitted. A convenient booking-office is to be found next door. An efficient orchestra is accommodated in a commodious well. The above text in quotes was first published in the Stage Newspaper 24th of April 1924. The Alhambra Theatre opened on Saturday the 19th of April 1924, although the official opening was on the following Easter Monday. As stated above revues were the main attraction at first but the Theatre did indeed show the Charlie Chaplin film 'A Woman of Paris' the following month on May the 12th 1924. Sadly the Alhambra's Proprietor John Tellam died shortly after the Theatre opened, on the 23rd of July 1924, so its Manager G. E. Prance then took over the running of the Theatre. Films were always a part of the Alhambra's programming and it was soon showing the 'Talkies' too which arrived in August 1930. The Theatre closed at the outbreak of war in September 1939 but reopened a few days afterwards. However, at 6pm on Tuesday the 22nd of April 1941 the Theatre was destroyed by enemy bombs. There is a photograph of the destruction of the Theatre here. And that was the end for the Alhambra and its short but involved history, dating back to its original opening as the Empire Theatre on Monday the 26th of March 1894. Some of the early information for this Theatre was gleaned from the very informative website of The Encyclopaedia of Plymouth History. The Dock Theatre was built in 1762 and was situated in Cumberland Gardens, Plymouth Dock. When the area was renamed Devonport in January 1824 the Theatre was renamed the Devenport Theatre. The Theatre was renamed the Theatre Royal for a short time too, but had no true reason to be so called. Sarah Siddons is said to have appeared there in 1785 as Lady Macbeth. In 1879 the Theatre was rebuilt after a fire but was closed in 1890 and demolished in 1899.